At rest between folders in drawers. The watercolours parched as the Mojave. In the shadow of curtains. 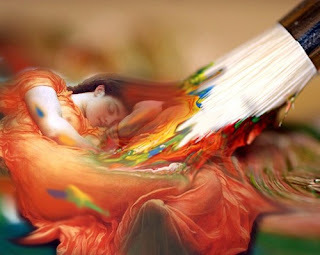 The heart of the artist, asleep. In the music of life around you. The feathers of that bird caught up in nectar. Pay attention again to the longings. Rise into the remembrance of paint. Oh, wow. That's how I feel! I so want to write poems/prose again!! Hi Tammy, yes! Let the creative juices flow! Thanks for stopping by. Thank you so much Lisa! I love your poetry and the reflections you have been posting at Living Tree Poetry!